Taipei’s most delectable treasure is a small piece of rock transformed into a mouth-watering slice of Dongpo pork. In Asia, the famous Meat-shaped stone from the Qing dynasty (1644-1911) has been likened in its fame to Europe’s Mona Lisa , with crowds flocking to see it year round. 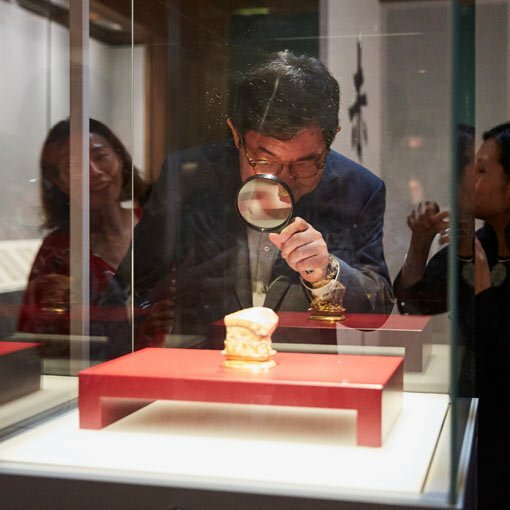 It is one of the highlights of the exhibition Heaven and earth in Chinese art: treasures from the National Palace Museum, Taipei at the Art Gallery of NSW until 5 May 2019. The gifted carver added browns of various depths from top to bottom to enhance the resemblance of this unusual layered piece of jasper to a piece of tender and juicy pork-belly meat cooked in soy sauce, often referred as ‘Dongpo pork’. He also created tiny indentations on the top to imitate soft pork skin. The name Dongpo pork comes from a legend that the poet Su Shi (also known as Su Dongpo) invented this specific way of braising pork belly. 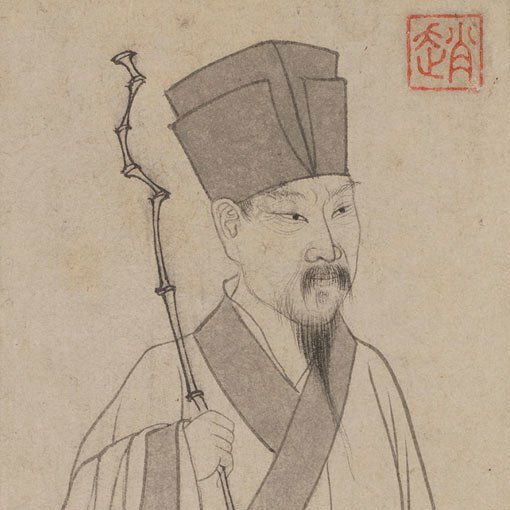 Su Shi was one of the most important literary masters of the Northern Song period, and an imagined portrait of him also features in the exhibition alongside two of his literary works – ‘Odes on the Red Cliff’ – in calligraphic script, produced by the highly esteemed artist Zhao Mengfu. In another extraordinary feat of workmanship, the famous ivory carver Chen Zuzhang engraved the entire text of Su Shi’s ‘Latter ode on the Red Cliff’ in running script, along with the date and carver’s signature, on the underside of a miniature boat carved out of a humble olive pit, on display in the exhibition. Under the woven bamboo awnings of this magnificently detailed object are eight people, including a boatman, attendants and passengers, as well as furniture, ropes and sails. The openwork doors and windows can be opened and closed. To celebrate the Year of the Pig, Chiswick at the Gallery is offering a dining package featuring Dongpo-inspired pork belly. The package includes an exhibition ticket, two-course meal and a glass of wine or beer. For those looking for inspiration in their own kitchens, here’s a recipe for crispy pork belly from Matt Moran, one of the people behind Chiswick at the Gallery, adapted from his cookbook When I get home , published by the Penguin Group Australia. 1. Score the pork belly 1cm apart. Rub in salt and spices. Leave for 2 hours, then rinse and pat dry with kitchen paper. 2. Preheat oven to 250 degrees Celsius. 3. Place the skin on a wire rack in a roasting tin, skin-side up, and rub with oil. Roast for 30 minutes until crispy, the reduce the temperature to 160 degrees Celsius. Roast for a further 40 minutes until tender. Remove, cover with foil and leave to rest for 15 minutes.